Likely one of the busiest men in the industry right now is Logic, as he is working on a million things at once. While entirely ambitious, the rapper is working on a movie, several television projects, a couple of books and, of course, music. With so much in the plans for the next 365 days, Logic is commemorating an important time in his life, inking the title of his first novel on his arm for him to see every day. For many, tattoos are some of the most personal markings one may consider in their lives and, with Logic not sporting much ink on his body, this one likely means a lot to him. Logic revealed last year that he was writing his first novel and, in an interview with Ryan Seacrest last week, the rapper announced he had completed the work titled "Supermarket" and was working on his second literary piece. In order to mark the conclusion of his first book, he put down the pen and instead opted for an artist to permanently mark his skin with the word "Supermarket." 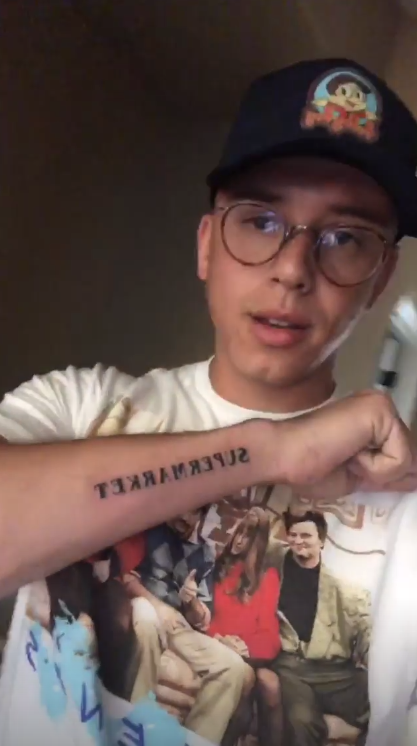 While the word choice may seem questionable to anybody not familiar with Logic's novel, the piece is incredibly personal to him as he shared footage of himself getting tatted on his Instagram story. Although there is not yet a release date announced for his debut novel, members of his Rattpack will be sure to line up whenever the book hits their local Barnes & Noble.